Mix together some white and orange paint to make a peach shade. Paint the back of your paper plate and leave to dry. Take some yellow paper and cut two arches. Snip either side of each arch into strips (dont cut through the middle). Glue to the top and the bottom of the paper plate as straw. 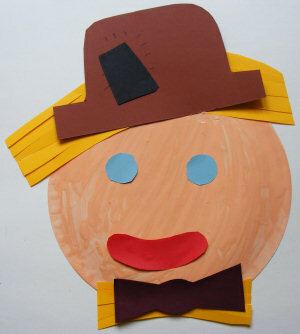 From the rest of the paper cut eyes, mouth, hat, bowtie, and whatever else you would like to decorate your scarecrow and glue them to the plate..